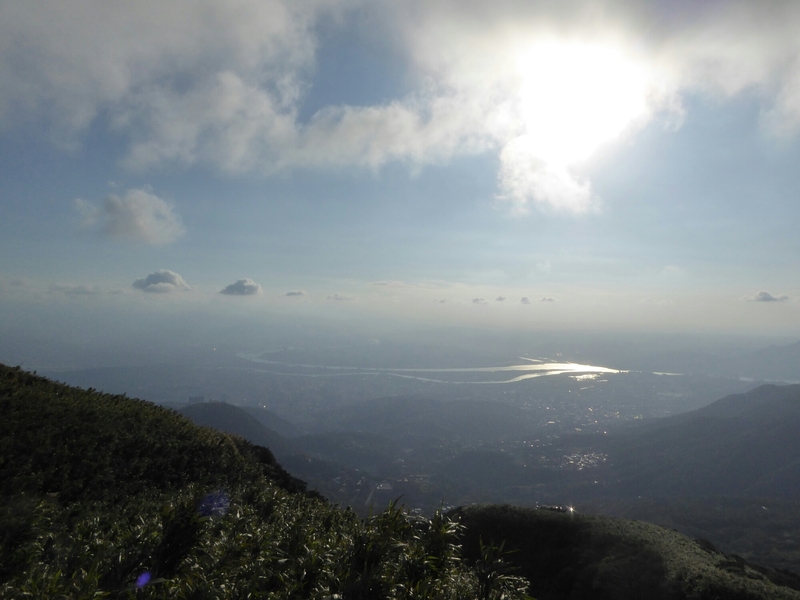 We had wanted to go to Yangminshan National Park on our last Taipei visit but the weather was crap so we kept waiting for that good day, today is that day! Forcast was for 26 degrees and sunshine all day. We took warm clothes though, in (the frankly unlikely) case the weather situation changed to cloudy and cold. First stop was Taipei main station to send postcards home, and for Guy to get accosted by a couple of Jehovoh’s witnesses. They started the conversation by asking him what makes for a happy marriage, when he started to tell them they shoved a leaflet into his hands and changed the subject. Bus 260 took us to the start of the mountain trail, it was a 30 min journey. 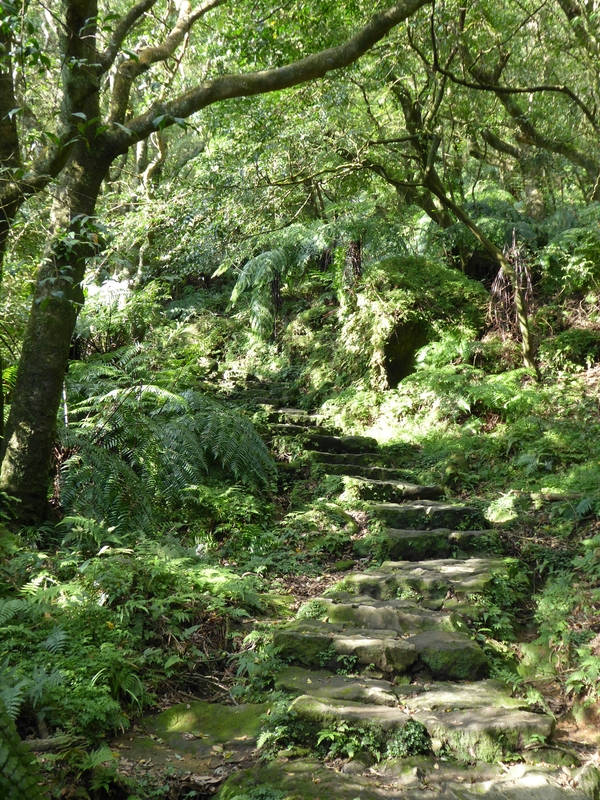 Imagine that, a 30 min bus journey from London, Birmingham or Manchester and you are in a stunning, thermally active national park. 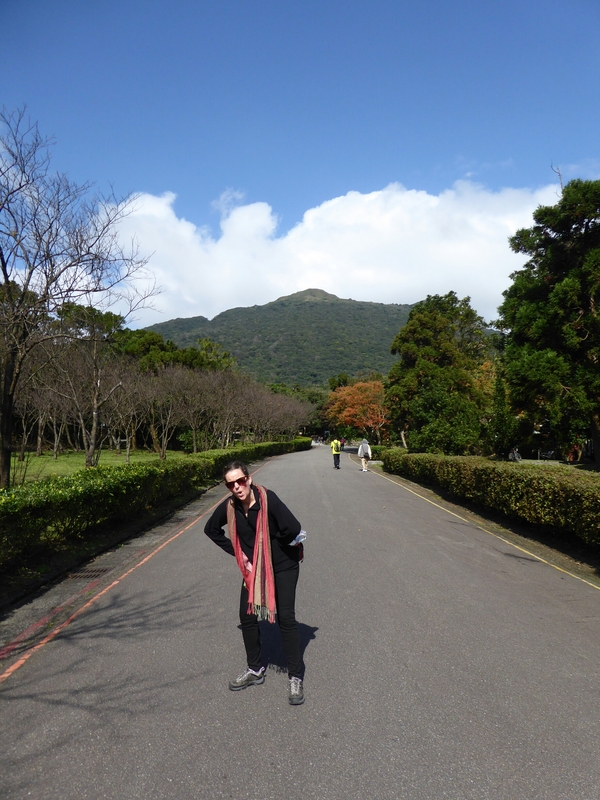 Photo below is me looking forward to the hike up the mountain in the distance! We stocked up on almond snickers to accompany our dried Irwin mangos and water supplies and set off on a 800m elevation, 2.4km climb to the summit. It was a bit tough going at times on our aging limbs, but we made it. We kept seeing a Taiwanese chap who was in training for EBC (Everest Base Camp to the uninitiated) for his 50th birthday present to himself in 2 years time! We did it in a similar time to him, albeit slightly more sweaty and red faced. 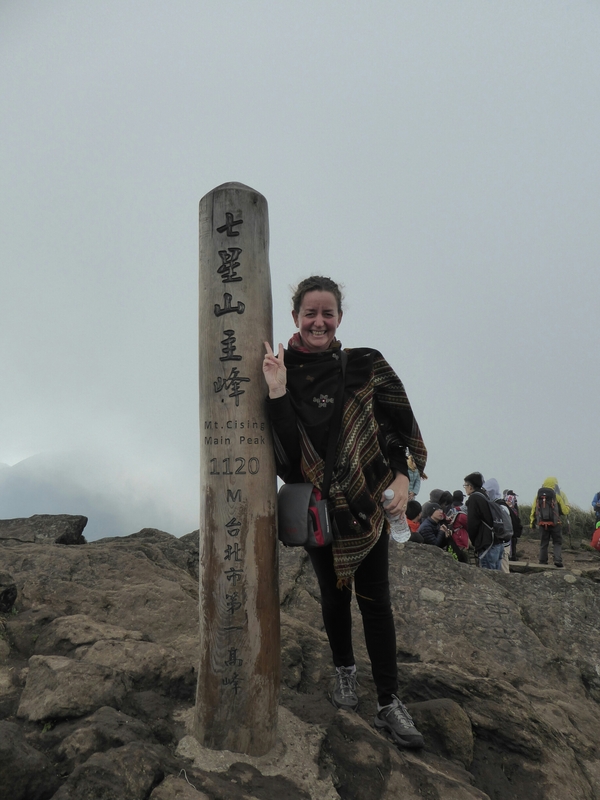 We were welcomed by cloud and cold at the top of the mountain, thank goodness for our extra clothes! By the time I had queued 15 mins for the obligatory photo the sky had started to clear and we had a birds eye view of Taipei, including rivers and surrounding coastlines. It really was worth the sweat and red faces. 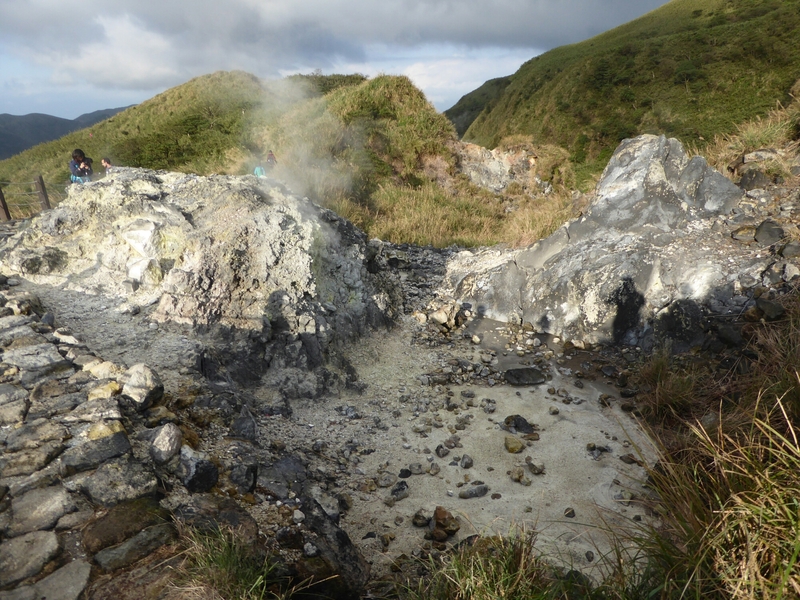 The track down the other side of the mountain passed through thermal pools, pockets of steaming white, blue and green rocks and blackened grass. The smell of sulphur was constant, reminding me of the inevitable byproduct of Christmas stuffing, something I will not miss this year. Transport was seamless on the way back, tourist shuttle bus back to the bus terminal where the 260 bus was waiting to be crammed full of people to be taken back to Taipei. We were agonising over our last meal here, and decided to have a bit of everything in Breeze gourmet station cafe. The words gourmet and station are incompatible in the UK but here they all fit together seemlessly. 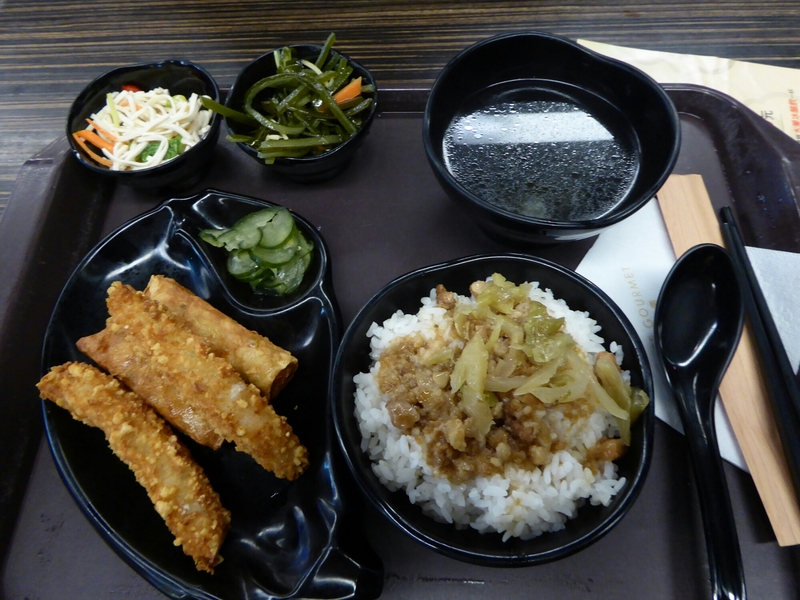 We had skipped lunch, snickers and mango doesn’t count, so after doing 2 laps of the food court floor we had pork on rice, crispy fried fish and tofu pockets to share. 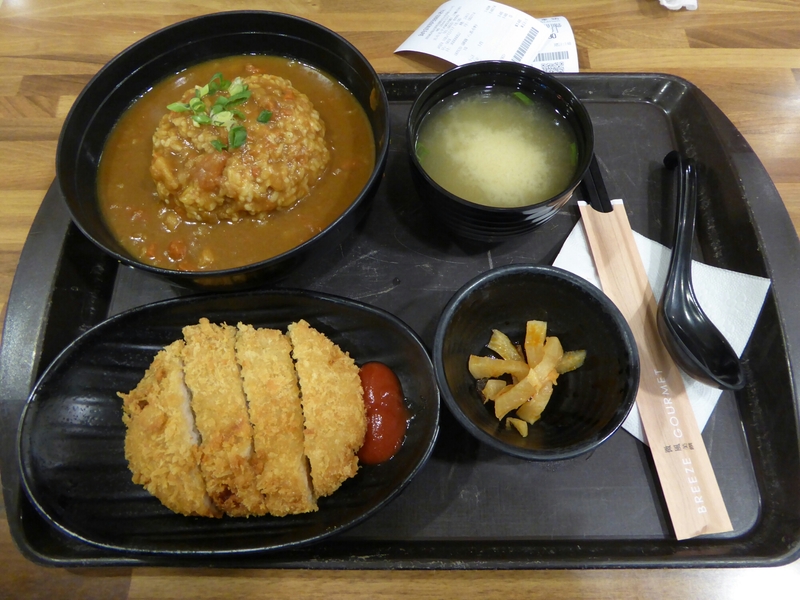 In the next food court we had chinese curry, pork cutlet, rice and pickles and miso for one meal and butter chicken, nan, rice, pickles and miso for the other meal. Yes, we did slightly over eat but it was delicious. 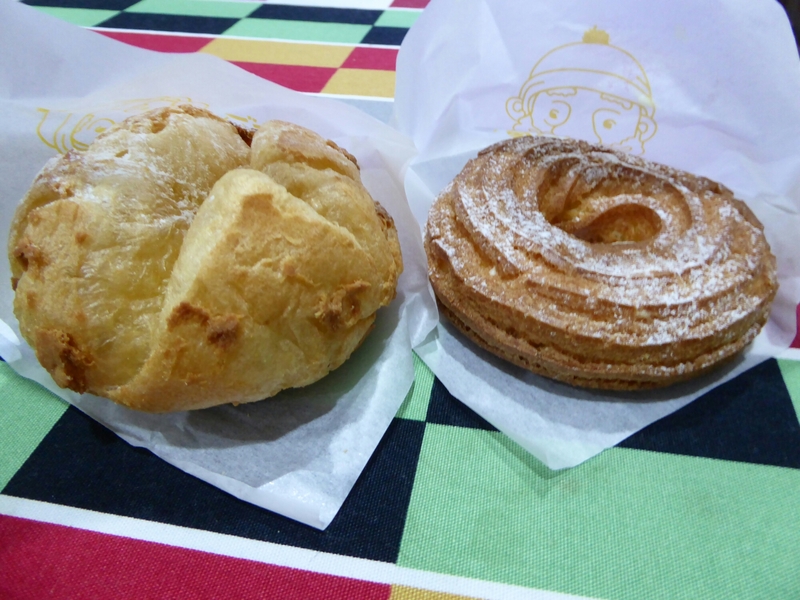 If that wasn’t enough we got distracted in a bakery with bread goods and Papa Beard for cream patisserie filled buns. Anyone would think we were going to a country that had no food culture! The evening was spent watching The Expendables 2 and making the most of the excellent wifi and skyping home.